ZWO, the worldwide leading supplier of astrophotography equipment, published the ASIAIR 1.0.7 version. 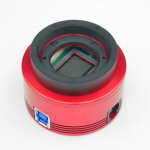 As a revolutionary product in DSO astrophotography, ASIAIR has been received popular recognition and highly praised by users since its release. Soft shutdown not only increases the power-off security of ASIAIR system, but also reduces the operating cost when it is necessary to stop current session. For example, on a cold winter night, you can shut down your ASIAIR without going back to your shooting place. To improve the operating experience in preview, the “continuous preview” function has been added. This feature is off by default and users need to activate it under “Main Camera Settings” > “Advanced Settings”. In the Focus, the Crosshair function is added for the convenience of aligning the star and positioning the center of the field of view. In early ASIAIR design, controlling mount go to the specified target needs to bridge with SkySafari, which brings operational complexity. In the previous version GoTo was added, only the input of the target’s RA/DEC value is required, then we can control the equatorial. However, it is not easy-operating enough. In this version, we have added the “Choose Object” function. User only needs to open the “Telescope Settings” and click the “Choose Object” button to select the shooting target or make some obversion plans. The star library contains a total of 14057 targets in M, NGC, and IC catalogues. The default list after entry is “Best tonight” which calculates based on the latitude and longitude of the user’s location (from 6 pm to 6 am). Object Thumbnail, Object Number (common name or number corresponding to other catalogues), Size, Mag, RA/DEC etc., the angle of view curve tonight. User can complete the selection by “clicking on the row area of the object twice” or by clicking on the “Choose” button. Click on the thumbnail of the target in the list you will see more information. As mentioned above “make some obversion plans”, due to the changing seasons, we can set the obversion plans according to the visibility of the target. This is just a simple application scenario where users can customize the list to suit their hobbies and habits. Custom Object Lists can be deleted and renamed. After creating the list, the user can add the target to it by searching or going to the “Tonight’s Best” list. Just slide left (IOS) or long press (robot) in the row where the object is located, and follow the instructions. Custom objects in the list can also be added to other lists and deleted. In this version, EQMOD supports for the SkyWatcher SynScan Equatorial Mount has also been added. Exclude the above functions, in 1.0.7 version, the “Update Log” is also added, and the GoTo logic, operation prompts, settings, and saved image file name are optimized as well. In the next version 1.0.8, the long-awaited “Dither” function will be added. We firmly believe that keeping updating our product is one of the most responsible ways to our users. Great to see new version. Continuous Preview doesn’t seem to be there in the Android version of 1.0.7. It is not an option under advanced settings for camera. It is there in the iOS version of the app. Android version is on the way, maybe a little late than IOS version.